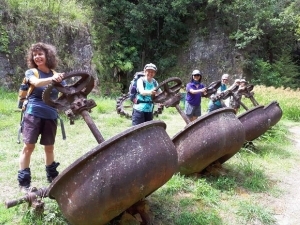 Nineteen members met at the corner of Onemana Road and SH25 at 9.30 a.m. for this excursion. 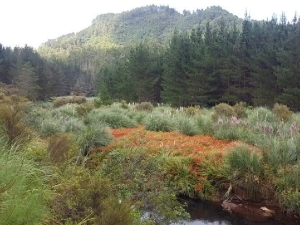 After introductory comments, we journeyed 3 km down Taungatara Road (in Tairua Forest) to the start of the Luck At Last track. It was an easy one-hour walk along the Wharekawa River to the battery site, passing the "Soap Box", "Bus Stop" and a 2006 Flood Level Indicator on the way. The forest company (Carter Holt) have gone to considerable trouble to erect historic information panels and signage along the way. There were pleasant views of the river at various points. The battery site is a lovely setting. 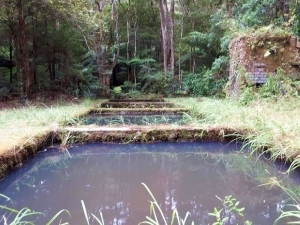 It contains a row of six berdans, pelton wheel, cyanite ponds, and various other impressive relics. Several remained at the site while the others visited the adits and tunnels to the north on slightly more difficult, steeper and less-formed tracks. The mine yielded 13,136oz of gold between 1899 and 1901, valued then at £17,666 (today approximately $NZ2.5m), not enough to significantly recompense its investors. At the battery we enjoyed a late lunch on three-sided seating. Phillip Donnell led a reflection based on the words of Jesus in Mark 8:36-37, highlighting the truths that we all have a soul, it is more valuable that everything else in the universe (an appropriate insight at the location of a gold mine! ), a soul can be lost but it can also be saved through faith in Jesus. He played Jim Reeves singing "I'd rather have Jesus than silver or gold..."
We then ambled back to our vehicles and headed for Tairua. 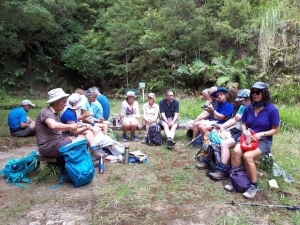 While several took advantage of the coffee and ice cream purveyors, the remainder climbed to the summit of Paku (192m) for magnificent views of Pauanui, Tairua Harbour, Slipper Island, the Alderman Islands, and the coastline northwards. After a rendezvous back at Tairua, one car left to return to Auckland, while the other vehicles headed for Ian and Christine Marshall's lovely shared property at Opoutere for a BBQ meal. The Tauranga contingent departed for home about 8.30 p.m. Many thanks to Phillip Donnell for leading the hikes, and to Paul Campbell for his assistance, especially with arranging transport. Also to Ian and Christine Marshall for their kind hospitality.